The Music Academy of Toms River offers piano lessons for students of all ages and abilities from beginners to very advanced students. We offer every style of piano lessons from classical, jazz and pop. We have students who want to play just for fun and students who wish to prepare for college level study. We have multiple piano teachers on staff which enables us to match students with a teacher that works best with their particular age, ability and interest. Although we start piano lessons at any age, we recommend age 5 as the youngest to start private lessons. Before age 5 we recommend our group preschool music program. 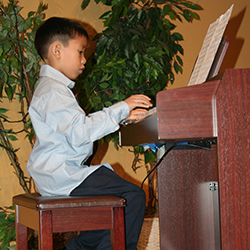 Our private piano lessons are one-on-one instruction and lesson lengths are 30 minutes or 60 minutes. For our advanced piano students we have teachers with master’s degrees in piano who can prepare them for university entrance exams and or programs. Our group piano lessons are meant for students who are motivated by, or just enjoy working as part of a team. The social interaction helps these students stay motivated and challenged in a supportive, friendly environment. Each class is a 45 minute session and limited to just 6 students per class. The class room is set up as a group piano lab with each student using an individual instrument for the class. Students will either progress into the next group level or into private lessons. These classes are meant for beginner level students. 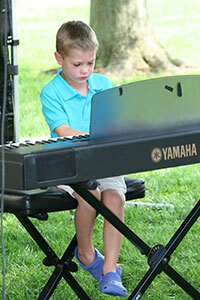 Group piano lessons are offered for beginners ages 4-6.